Do you know where your Hispanic employees are from? The majority of Hispanic employees that I've met in Western New York come from Mexico, though I've also come across a number from Guatemala. Regardless of their nationality, most are from rural areas, and many grew up with animals; possibly cows, horses, pigs or goats, but almost certainly chickens. (It's quite difficult to escape the crackly wakeup call of a rooster in Guatemala, even in urban areas!) Despite the fact that many worked with cows in their home countries, most come to New York having had no experience with modern dairying. Did you ever stop to think what the dairy industry is like where they come from? While I can't speak to Mexico, I can speak from personal experience about Guatemala. During my service as a Peace Corps volunteer, I lived in a village located in a mountainous region of eastern Guatemala. The cool climate makes it a much more suitable environment for dairy cows than the hot, humid climates at lower elevations, so many families have a few cows. My host family milked their herd of 10 cows once a day by hand and sold most of the milk to a local cheese maker. The cheese maker owns a small building in the village where dairymen bring their milk by truck or horse every morning. He makes cheese daily and sells it in the larger towns within about an hour’s radius from the village. The whey left over after making cheese is given to local women who feed it to pigs they raise to sell for meat. Since Central America has two seasons (6 months of rain and 6 months without rain) and farmers rely primarily on pasture to feed their cows, milk production is very seasonal. Therefore farmers don’t get paid much during the green, grassy, rainy season, but get paid handsomely if they have cows producing milk during the dry season. 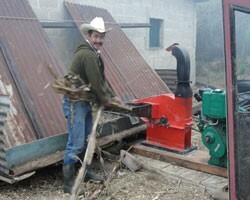 Some farmers have small stationary choppers they use to process the dry corn stalks left over from the grain harvest (corn is a staple in the Guatemalan human diet). A few actually plant corn to make silage. I enjoyed my host mom’s fresh cheese for months before she taught me how to make a traditional queso fresco. The milk is strained, and then heated (if not still warm from the cow). Rennet is added and the milk is left at room temperature for three to six hours, until it solidifies. Then it’s strained through a cheese cloth, salted, kneaded, and pressed into forms that make a one pound block of cheese. After about an hour the cheese will hold its form and can be removed from the mold and eaten. A one pound block of cheese sells for about 12 Quetzals (roughly $1.50). Alternately, the cheese can be left to cure for a few months to produce an aged cheese, or the whey can be boiled to produce requeson, which is similar to ricotta cheese. An interesting bit of local lore: pregnant woman can’t make cheese because the milk won’t curdle. When was the last time any of you milked a cow out by hand? My host family was shocked when I told them that I had only ever milked a cow with a machine. (They remedied that situation pretty quickly). As can be expected from the production system I’ve described, cows in Guatemala don’t make much milk. But I suspect that fifteen or twenty pounds a day looks a lot better than 85 when you milk by hand!